Huge congratulations to Megan Brierley on being crowned Under 15 Girls Doubles English National Champion with her partner, Leicestershire’s Sophie Watson. The event took place at the Redbridge Sports & Leisure in Essex on Saturday 14th & Sunday 15th April 2018. Megan and Sophie advanced through to the semi-finals where they played the No.2 seeds, winning in 3 sets 21-16 14-21 21-19. 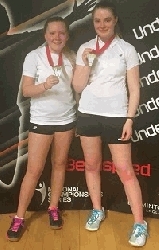 In the final they played an unseeded pair, coming from a game down to win 6-21 21-18 21-19 in a hard fought match. The pair were coached to victory by Nottinghamshire’s England International Peter Mills alongside Sophie's Leicestershire County coach.